How do you choose the best trucking service in Hawaii? Cost is a factor, but price doesn’t necessarily reflect value. A reliable trucking service that’s also flexible can help you avoid upcharges, long delays, and damaged goods. So how do you ensure that your provider will deliver a low-stress, safe and affordable experience? Royal Hawaiian Movers recommends asking a few key questions before engaging a hauling and trucking service in Hawaii. Whether you’re planning a residential or commercial move, interisland or across the Pacific, doing your homework is a smart move. How long has the company provided container packing, trucking and hauling services to and from Hawaii? Look for a company with a proven track record in local pickup and delivery to and from the continental U.S., Guam and the islands of Hawaii. Thanks to the dedication and Aloha Spirit of our staff members (many have been with us for more than 25 years) since 1982, we’ve become one of the largest transportation trucking services in Hawaii. What type of trucking services do you offer? 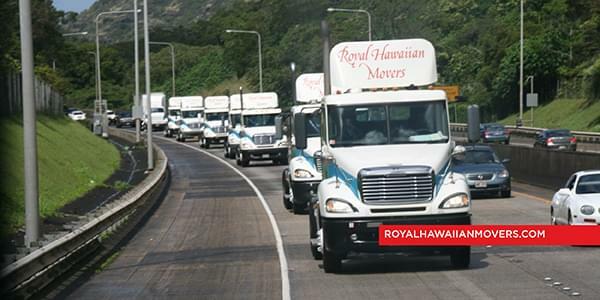 Royal Hawaiian Movers trucking service can be broken down into two main categories, freight and household goods. Our freight trucking services are typically services where we are picking up or delivering commercial goods from a place of business. Our household goods trucking services are typically services where we are picking up or delivering household goods from a customer’s residential address. We will talk a bit more about each type of service below. Do they offer specialized freight, shipping container and trucking services? Royal Hawaiian is a full-service trucking and container shipping company. We maintain tractors, trailers, flatbed trucks, box trucks, air-ride transportation, hazardous material transport and specialty medical transport equipment. 300 pieces of specialized equipment are available to accommodate different container types and heavy equipment hauling and trucking. Our professional blocking and bracing services offer the ultimate damage prevention for containerized freight shipments. Maximizing the cube space while ensuring safety and security is our goal. Various sizes, structures, materials and specialized capabilities of containers are critical to cargo shipping, from dry storage containers to drums for transporting bulk liquid materials. Do they provide container trucking services to and from the port for shipping? Royal Hawaiian Movers maintains its own trucks and warehouses on all four Hawaiian Islands. We make it easy by taking care of the container pickup and delivery trucking service at both ends of your move. We offer door-to-door, port-to-door, door-to-port, and port-to-port transportation solutions for all types of cargo. Who is responsible for freight transport projects that take months to complete? Experienced and knowledgeable Royal Hawaiian staff members will oversee your freight shipping, hauling, and trucking project from start to finish. Our Hawaii freight terminals are staffed by licensed experts and fully equipped to receive all types of containers. Royal Hawaiian has decades of experience in container shipping: packing, loading into containers, shipping, storage, and delivery. Our Sister Companies operate terminals in the continental U.S., Alaska, and Guam. Together, we offer consolidation and deconsolidation services, trucking, warehousing, shipping, and pickup and delivery for both commercial and household goods. What happens if you don’t have easy access to the container? Sometimes the container can’t be placed close to the pickup or drop-off point. Limited street access, community association regulations or space constraints can require shuttling furniture and goods. Got trucks? Loading ramps and dollies? Parking permits? Friends with strong backs? Yikes. Let Royal Hawaiian Movers handle your container loading and unloading, including hauling and trucking services. Can you save money by loading my own container? Not necessarily. The logistics of loading a container for secure hauling and trucking start with properly packing the boxes and items inside. Improper packing is one of the main causes of breaking and damage, especially in an overseas move. We’re happy to share the best packing tips with you, and to explain our full-service packing, furniture wrapping and unpacking services. To request a quote on local trucking services, fill out our online form, or contact us by phone or email today!